‘Charmed Wine,’ shade to part shade, 12-16” tall, about equal spread. 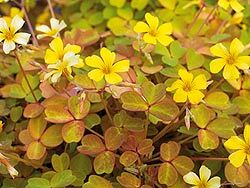 To this meager list, add Oxalis, by far the largest genus in the wood-sorrel family Oxalidaceae, over 800 species of which grow virtually everywhere in the world except the polar regions, though richest in diversity across the forests and jungles of Brazil, Mexico, and South Africa. Bless their hearts, over the eons they adapted to shade. Plant hybridizers discovered them ages ago, and in more recent years the Proven Winners® folks have developed numerous, noteworthy hybrids, a clutch of non-invasive cuties that flourish in shade (plus two killers for sun). Containers in shade? 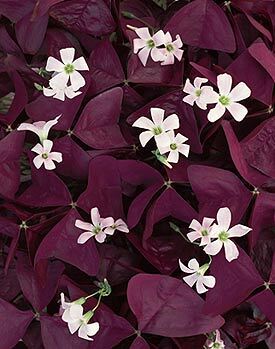 Oxalis ‘Charmed Wine,’ baby, pure white trumpet flowers held just above rich burgundy, shamrock-like leaves. A member (as are all the hybrids to follow) of the Renegade Gardener’s “Perfect Plant Club,” that is, plants that have pretty flowers and attractive foliage working together in harmonious contrast. 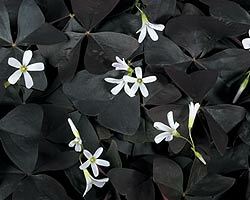 ‘Charmed Velvet’ is just as stunning, smaller white flowers dancing across velvety black leaves. Repeat: black leaves. Plant either of these two in swaths (or clumps of three) amid the hosta, ferns, and other denizens of shade. They are drought tolerant plants, though will need regular, weekly watering the first three weeks or so, to become established. (In containers, they will handle the higher water frequency container gardening entails). In the garden, plant in decent draining soil that has been amended with a bit of organic matter, and fertilizing is not necessary. Nor is deadheading, unless you’re the Renegade Gardener, who deadheads everything because, well, it makes a plant look nicer, encourages more new bloom, and besides, what else is better to do when you’re writing an update on a Sunday afternoon and the words stop flowing? You make a fresh pot of coffee, then step outside and deadhead your containers for five minutes. Skip the deadheading, however, and spent flowers will drop and new ones appear for a solid three months or longer. 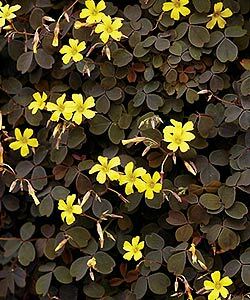 Like ninety-five percent of what are called annuals, Oxalis is not a true annual; they’re perennials in zones 8-11 (someone gardening in Zone 11 give me a holler sometime, will ya? I believe the zone encompasses Honolulu and Brownsville, Texas). ‘Molten Lava.’ Mounding to 8-10” high. Great at the edge of bowls. See what five minutes of deadheading does for you? Both are fabulous in containers. You get terrific bloom, fierce foliage, and unless combined with red geraniums, you can’t really screw the container up.